The turning from Al Hamra over Jabal Akhdar was marked by a group of men examining the antics of a driver who had decided to round off the edges of his car by rolling it a few times. We turned northwest and drove on the tarmac road for about 20 km until the ridge at just over 2000m above sea level. We spotted a few clouds. At the car park at Sharaf Al Amayn, we stopped for a photo opportunity and a couple of polo mints before taking the graded track towards Nakhal. The track squiggled and un dulated through the craggy mountains in places most unsuitable for nervous mother-in-laws. We spotted a few more clouds. Lunch was taken with several wasps at a camping spot after Balad Sayt. The temperature was a wonderfully cool 27C. The clouds above had thickened and filled the sky in the narrow valley before rain hastened our departure. 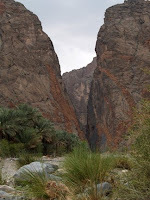 The rain did not last long as we continued into Wadi Bani Awf, stopping briefly at the entrance of Snake Gorge where small groups of locals were sleeping off the Eid holiday. We continued along the wadi splashing though streams of water like big children in our grown-up toys.